A lot of people hear the words ‘free campsites’, and they assume it will cost zero dollars. While this is true for some locations, it is often not the case — freedom camping means that you are self-reliant or self-contained. It means you must supply your own power, water and sometimes your own amenities; however, we have found that there are a lot that will have a toilet of some sort. We have taken to calling them ‘freedom camps’, as this removes the assumption that they cost nothing. While we here at Four Hands in a Tin Can have not completed a lap yet, we have come across some awesome freedom camps. We are not big on 24-hour stops, so the ones we will introduce you to will often allow a longer stay. Every stay is also pet-friendly, which is important to us as Diga Dog is a vital part of our family. Feeding the brumbies at Pillaga Bore. This is one of our all-time favourite campsites in winter, but I don’t think we would be game to camp there in summer as it would be too hot. You camp around a hot artesian bore and can enjoy a soak in the 36-degree water at any time of the day or evening. While you feel like you are in the middle of no-where, and it certainly looks like it, you are only about half an hour away from Coonamble, about 40 minutes from Wee Waa. The campground itself provides flushing toilets and a cold shower, which are cleaned and stocked three days a week. For $5 a night per caravan, and a maximum 21-day stay, we think this place is worth the trip. Where: 96km from Narrabri on the Pilliga Road. Our first word when driving into Lipson Cove was “wow”. The beach, the water and the stunning simplicity of this location just blew us away. This campsite, on the east coast of the Eyre Peninsula, is on the beach, providing uninterrupted views of the ocean, with the waves at night lulling you to sleep. Clean, stocked toilets are provided as well as numbered camping bays, meaning that one van can’t take up three spots at the expense of others. While this is not a national park, there is a ranger that pops in to collect the camping fees ($10 per van per night), clean and restock the toilets, and to ensure that all is running as it should. The biggest surprise of this location is of an evening, when the starlings comes to roost on the small, rocky island just offshore. There are thousands of the birds, and they do like to show off their flying skills, with amazing formations and swooping upon the island. It’s a sight not to be missed. Where: The Lipson Cove campground is 8km off the Lincoln Highway, with the turn-off about 10km from Tumby Bay. The road in is accessible by 2WDs. A travelling family told us about this camping area. As it was just near Cervantes, we thought it was a great place to stop for a couple of nights. This extend to a couple more but, as is often the case, when you happen upon an unreal location, you need to stay longer. There are onsite caretakers who ensure the drop toilets are clean and stocked daily. I think this was the first time we all realised we could actually breathe when using a drop toilet without having to hold our breath the entire time! The caravan bays are marked out with timber beams to ensure orderly camping; however, the bays are large and allow for fires. Considering the campground is behind a sand dune, with direct access to the beach, its great it is being maintained to ensure it remains inviting and accessible for all. We enjoyed sand-boarding down the dunes, and with sand boards available for hire for $20 for a day, why wouldn’t you spend a few hours running up sand dunes only to fling yourself down them at speed? We loved the sunsets, walking along the beach and casting a line in from the water’s edge. This is a place to stop and relax. Where: About 250km north of Perth, and 10km north of Jurien Bay, at the end of Sandy Cape Road (turn-off Indian Ocean Drive). This is one location that is worth the time, and being there on a public holiday was a highlight for us. On the Fleurieu Peninsula, this large campground offers flushing toilets, an onsite caretaker and direct access to a jetty, boat ramp and beach. It was once a mining town, but is now just there for campers to visit and enjoy. The water is lovely to swim in, and of course dogs are allowed on the beach; however, there are times when they need to be controlled, and it does get busy with boats being launched and cars on the sand. There is a small cost for adults ($7 per night) and children over 5 ($3.50) to stay at this campground. Where: 17 Finnis Drive, Rapid Bay, SA. This is a lovely surprise on the Murray River. The Murray River was dredged and all trees and shrubs removed from this area, and it literally is like a beach on the Murray. This was also the first spot where Diga Dog ever went for a proper swim, so it holds a special place in our hearts. We were there in the week leading up to Christmas, and it was quite, but we can imagine it being very busy over weekends and holiday periods. There is a boat ramp as well, so it’s a popular spot for those with a tinny. For $5 a day per van, you get drinking water hooked-up to the van, as well as a well-maintained amenities block. The town of Tocumwal is within walking distance. Where: Town Beach Road, Tocumwal — the campground is at the end of the road. New Norcia is Australia’s only Monastic town. This is the only Monastic town in Australia. While it only has a very small number of monks still in residence, it is town that allows freedom camping, where you must be self-contained, for $10 a night. There is a lot to see in this town, and with daily walking tours that provide access to some of the grand old buildings, and a museum that will make time ‘disappear’, it is worth the time and effort. Where: New Norcia is 132 km north of Perth, near the Great Northern Highway, next to the banks of the Moore River. Now, the Eyre Highway that leads one across the Nullarbor and into Western Australia is full of freedom campsites, but you cannot go past Bunda Cliffs, specifically the campground at Bunda Cliffs Lookout 1. Camping right there, on the bight, overlooking the large cliffs into an unforgiving ocean… why wouldn’t you? You do need to be self-contained, as there are no toilets or water hook-ups, but you will never forget your time here. Words will never adequately explain how special this location is. Where: Bunda Cliffs Lookout 1 is an overnight stay about 75km east of Border Village (southern side of the Eyre Highway). This is a quaint town in the Tara district and for $10 for three nights of power and water, or free if you don’t want to hook-up, this town will offer you a little bit of relaxation and exploration. We spent a lot of time in the locally cared for war museum, which is dedicated to local men who have been to war. It is one of the best small-town war memorial museums we have ever visited. It also has military vehicles at an old railway, near the campground, for the kids to climb all over and explore, as well as being able to explore the old railway house. This is a little town that you would miss, but really shouldn’t. Where: Meandarra is 55km south of Condamine, Qld. 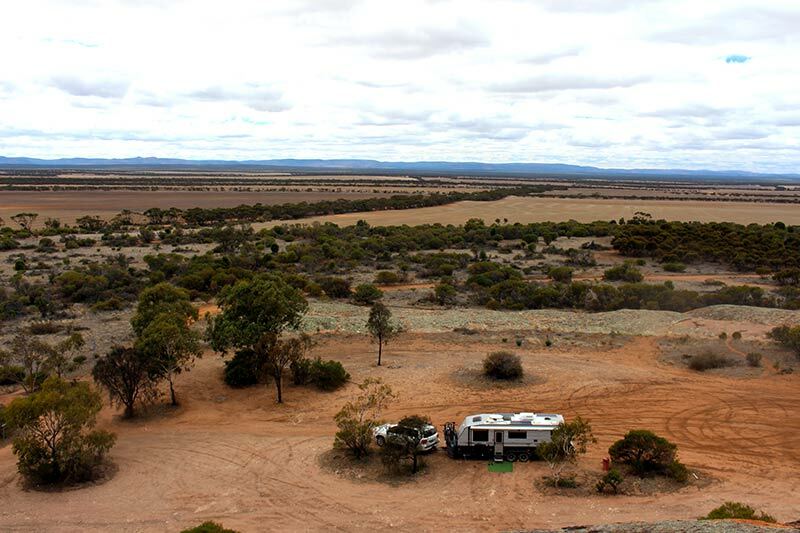 Try the Brigalow Creek campground — a small fee applies. We had always wanted to see a pink lake, so when we heard about one in Victoria, and that we would be driving past the town, we had to stop. 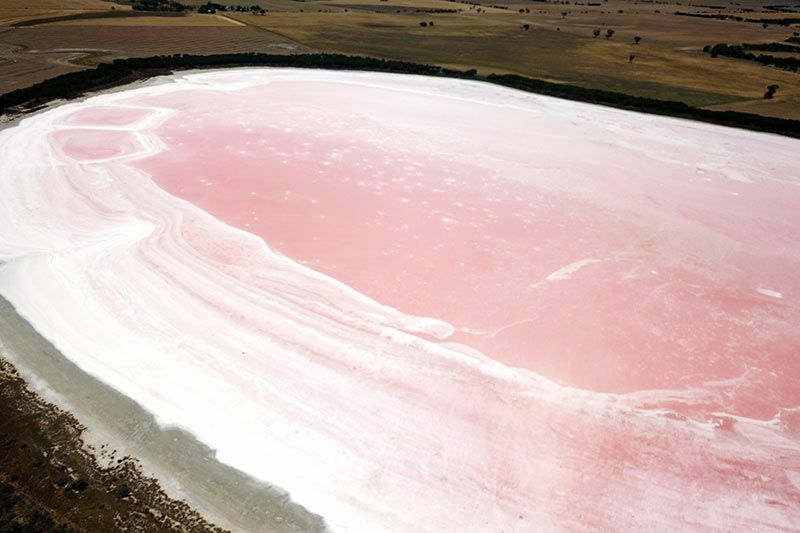 We literally drove from the Grampians to Dimboola and explored this pink lake. Dimboola has a camp in the showgrounds that will cost you nothing. It is for 48 hours and is worth the detour. After all, we got to walk on a pink lake, sink our feet into all that pink salt and, well, it was pink! The town has a great coffee shop, and an awesome pub that is filled to bursting with memorabilia. We spent hours checking out the pub, and the food was great as well. This town is also on the doorstep of Little Desert National Park, which also has a range low-cost campsites. Where: Dimboola is in Victoria’s Wimmera region, 334km north-west of Melbourne, a couple of kilometres off the Western Highway. This is a camping location that offers something for everyone. You can pay for a powered site, or freedom-camp around the lake for a donation. There are also cabins available, so even if you don’t have your tent, caravan, camper or motorhome, you can still enjoy this awesome location. It is on the Silo Art Trail, so if for no other reason, you will be in this area just to see those awesome silos. There were toilets and showers available in both the powered area and the freedom-camping area of the grounds. There is a boat ramp, too, as the lake is well utilised for water skiing and fishing. The town of Hopetoun is within walking distance from the lake, and offers supermarket as well as an awesome bakery, butcher and petrol station. It really is a place where you can relax for a few days and enjoy the scenery. Where: The campsite is on an unnamed road — follow your nose east of Hopetoun to the Lake Lascelles Rest Area. We have been to so many freedom campsites that we think there would be much discussion on about what to add to this list and what to take out. We know that many of you will be able to add your own to this list, and we know we will be adding a lot more to it as we continue our travels around this great country. For those of you from Tasmania, we promise that after our upcoming four months of traversing your wonderful countryside, we will highlight our favourite campsites there in an article all its own. Well done Liam. It is very exciting to hear about a young traveller who has started their writing career at an early age. I’m an old hand at the endeavour, and I still love it after many years of writing (probably for longer than you have been alive). Keep up the good work and I look forward to seeing more of your stories.